FAIRFIELD, CT- The Sacred Heart Pioneers have played many a non conference foe this season, and in fact knocked off quite a few notably UConn, Maryland, Rutgers, Brown, and Yale on their way to an 11-4 record. The Marquette Golden Eagles swooped in from the Big East at the beginning of their east coast swing, but did not fall prey to the Pioneers this night despite the rowdy crowd SHU had assembled. Marquette picked up a relatively large first set win to go up 1-0 in the set. The Pioneers were by no means going to be swept however. In set 2, the two teams volleyed to a 9-9 tie, and later an 18-18 tie after Sacred Heart took a brief lead to the point that Marquette had to call a time out to try to blunt it. Pioneer offense included a variety of attacks from Kimmee Roleder, and Johanna Ovsenek had several kills herself as well as a block or two. Alissa Young also took part in at least two blocks though SHU also benefited from an attack error or two. Marquette’s offense featured several kills from Kelsey Mattai, as well as Danielle Carlson having several attacks successful from the net, Ciara Jones launched a missile mid-set, and Ashley Beyer also added to the offensive punch. He and Carlson shared a block as well. Chelsea Heier’s one handed tap attack at the net pulled her team within 1 as well. The Pioneers however wanted to take control, and Christina Bauch sent a kill off of the defenders, to be followed by two straight Roleder kills. This put the red and white up 21-18. However a blast from Beyer, a SHU attack error, and a kill from Mertens tied it back up at 21-21. A time out by Sacred Heart stopped the run, and set up a kill from Elise Sage, and another from Roleder. Beyer responded with a big spike, but Ovsenek returned fire. Jones added a kill fro her team and the score was 24-23, but on the next back and forth an Golden Eagle sent the ball out of play, and SHU had the set 25-23, and the match was tied 1-1. Marquette however set out to do some damage in set 3 and started off leading the set 10 to 3. Their offense had come from sources like several kills from Mertens, a block from Mattai, a smash from Beyer, and a block from Mertens and Mattai, as well as one from Jones. Roleder picked up a kill as did for SHU during this time. Dianis Mercado’s kill for the Pioneers opened up a scoring run featuring a block and a kill from Roleder too, which brought the score to 7-10. No longer in command of a huge lead Marquette still kept their distance, as a SHU serve into the net and a block from Carlson returned the lead to 5. Roleder responded, but Heier set the ball to Carlson who whammed it home. The pair would have a similar connection throughout the match. Carlson picked up a kill to the back right after that and the MU lead grew to 14-8. As she continued to do Roleder struck and set the ball sailing off the defenders and onto the scorers table. Megan Pulone then served up an ace, and the lead was cut to four. The two teams continued the back and forth to a 20-16 score. MU had picked up another kill from Carlson and Jones along the way. Roleder and Ovsenek, and a Mercado kill late. The Golden Eagles shut the door thanks to a hack off the defenders at the net by Jones, a missile launched from Beyer, a shared block between Beyer and Carlson, and a yet another after that. It was 24-17. SHU picked up another point, but Carlson ended the set with a smash and to take the set 25-17. The Golden Eagles now led the match 2 to 1. The match would now be on the line, if Marquette could take the set they’d have it, or Sacred Heart could win it and force a set 5. The two teams battled to a 9-9 tie and a 16-16 tie. Heier opened the set with an Ace, and Beyer tapped the ball in on the defense. Roleder responded as did Kelsey Freeman and Ovsenek. Ovsenek and Pulone would strike later, though Jones would add a cross court kill, and Heier would use a tap in soon after, and Carlson had the team’s 9th point. SHU went on a run including a kill from Mercado, two more from Roleder, and another from Freeman. Roleder added another point in this time. 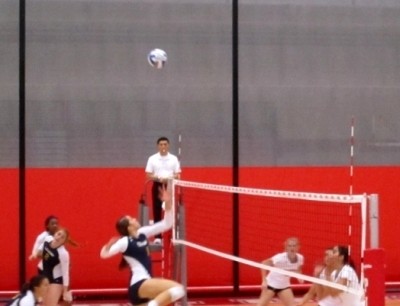 MU benefited from SHU errors, an ace from Carlson, and a cross court missile from Beyer. SHU built a lead as Mercado used a light tap, Jessica Colberg served up an Ace, and then another, her teammates added a block, and Sage put the ball down at the net, with Marquette only managing a point during that time, and the score was 22-18. Carlson picked up a kill and a SHU attack error cut their lead to 22-20, and the Pioneers called a time out. When play resumed Mercado had a big kill, but Heier set the ball to Carlson and she whammed it home. Beyer added a kill, and it was 23-22. Sage took a took point lead for SHU with a big kill, but Carlson’s tap attack kept the deficit one. Then the Golden Eagles picked up a block. Beyer than added a smash and MU had the lead, but Ovsenek smashed the ball off the block and the score was tied 25-25. The Pioneers served into the net, and MU had the advantage again. After a long rally back and forth Mattai and Heir shared a block and that was that. Set and match 27-25. Statwise for Marquette, Carlson, Jones, and Beyer had 13 kills each on the day, though Carlson had a .545 hit percentage. Mertens had 6 kills but a .455 hit percentage. Heier had 42 assists on the day, and Julie Jeziorowski had 13 digs, Beyer had 17 digs as well. Mattai took part in 7 blocks, Carlson and Jones each took part in 5. Rachel Stier had 2 service aces as well and the team had 6 overall. Looking at the numbers for Sacred Heart, Roleder had 25 kills and a .321 hit percentage. Ovsenek had 12 kills and .435 high percentage. Saga had 7 kills and Mercado 6 on the day. Alisa Mesa came up with 27 assists on the day, and Megan Pulone had 15. Colberg had her two aces as part of 3 total team aces. Colberg had 11 digs on the day, and Mercado had 12. Ovsenek took part in 2 blocks. Head Coach Bond Shymansky’s Marquette teamed moved to 11-4, and Rob Machan’s Sacred Heart dropped to 11-5 on the season. Editor’s Note: This is based on notes taken at the match, normally verified against the official play by play if possible. Reports focus on offense since it is easier to track but note defensive play whenever possible. It is difficult to note things like digs and assists although they are no doubt vital to the game. Also, a lot happens in a volleyball game, far more than can fit into a report, so this just notes some of it.